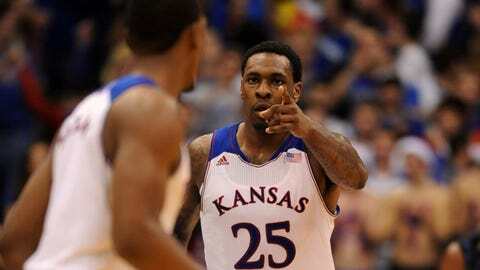 Tarik Black was a force down low for the Jayhawks against Georgetown. LAWRENCE, Kan. — Tarik Black never let his chin drop. He never quit working hard in practice. He never stopped making the rest of his Kansas teammates laugh until their stomachs hurt. Kansas built its 44-34 lead thanks in part to a 14-3 run fueled by its defense. Georgetown at one point went more than 10 1/2 minutes without a field goal, missing five straight attempts, turning the ball over and even getting hit with a shot-clock violation.